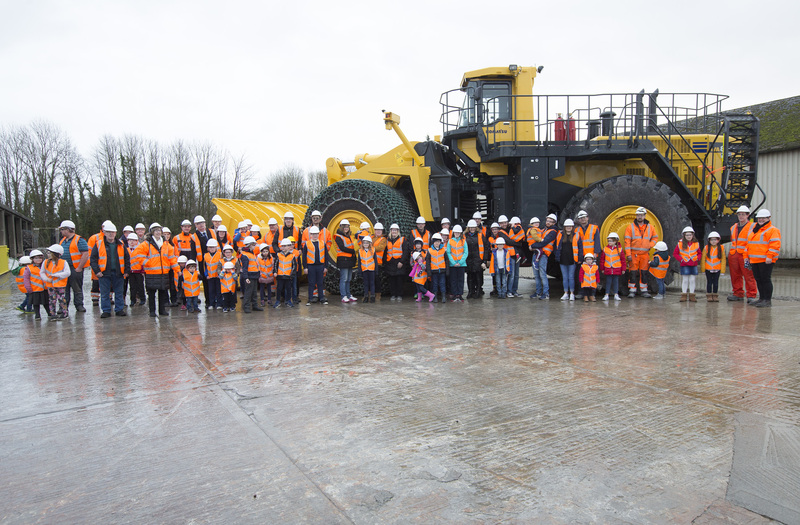 Pictured at Irish Cement’s Mungret factory at a family event to mark the entry into service on site of a new Komatsu digger are local staff members and their children. The newly-purchased ‘front-end loader’ represents a significant investment by Irish Cement and is the latest in a programme of modernisation and investment in the Mungret factory. The front-end loader will go into service in the quarry next week where it will be used to load limestone rock into dump trucks to be transported to the limestone crusher. With a bucket capacity of 20 tonnes, the front loader can fill the dump trucks with three bucketfuls. Its considerable size – taller and wider than an average double decker bus – makes it the largest machine on site in Mungret, and the largest of its kind sold in Ireland since 2005.